awards awardstags Birthday and Award.. 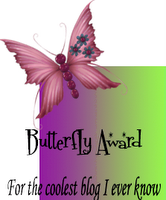 Guess what ,two days ago my cute little blogger friend Pankuri presented me the Butterfly award ,which is given for cool blogs on blogger world.Here ,it is. Pankhuri ,thank you for the award. 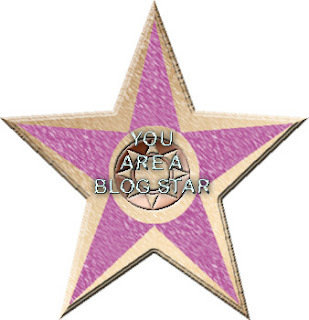 Now,I would like to present this award to my other blogger friends out here. 1.Sandeep Balan for Yem Bee Yae. 4.Anurag for Are you kidding. 6.Shruti for The Track I am on. Ok Pankuri ,thank you for the award,I liked it though..
Also ,I will like to thank my friend Priyanka for the Blog Star award. Happy birthday & Happy writing day too. Celebrate it like a 4-year-old :P And make it memorable. How I love birthdays !! happy bday again...and thks a ton for the award...u simply rawk!!!! And birthday wishes, in advance!! God Bless you!!! And yes Happy B'day....Don't study today :P....Have funn ...Nnjoy!!! He ste, many many happy returns of the day!!!!!!!!!!! Greetings on your birth anniversary. Peace, take care and blessed be. v all wish 4 yur bright future and loadzaa success..v luv yu all..!!!! and congrats on those awards! Happy Birthday again and congrats!! hey Check my blog ters a Surprise for you:)! and you really do have an amazing space here!!! first time here, and liked it...!! waitin for ur story, vl visit soon!! hopin to see u on my blog again too!! Good luck with your examinations. And Thankyou for following my Blog.